The Westmorland Way is a 95 mile Long Distance Path (LDP) which begins in the the famous horse-fare town of Appleby in the Pennines and traces a sensational route through the very best of the historic Lake District county of Westmorland. Crossing the high moorland of Shap, the Westmorland Way enters the Lake District National Park and then heads south to follow the shore of Ullswater. The Way passes through Wordsworth's Grasmere and the quintessential Lakeland town of Ambleside, before reaching Kendal and it finishes with a delightful riverside and canal tow path walk to Arnside on Morecambe Bay. This 7-day Westmorland Way itinerary is our recommended option for experienced walkers. It allows you to complete the route within a week of walking, with a longish day of 17 miles at the beginning and end of your journey, and mileages of 9 - 15 miles for the remainder. The 8-day Westmorland Way itinerary splits the section between Appleby and Pooley Bridge into three stages. This will be easier for walkers unaccustomed to (or simply not keen on) long days. It still has one day of 17 miles right at the end but at least this is mostly level walking following the river or canal. By walking the Westmorland Way over 9 stages you take the sting out of the head and the tail of the walk. The daily mileages are a very comfortable 8 to a maximum 15. This itinerary while still challenging enough will be more suited to first time Long Distance Path walkers or those who like plenty of time to explore and appreciate the views and amenities en route. Breakfast at your accommodation is included in the holiday price. In most cases your accommodation will be able to prepare a packed lunch for you. Alternatively there are supermarkets or shops in several towns and villages along the route if you want to make up your own lunches. There are also opportunities on several days to purchase snacks or a hot lunch along the way, and we will provide full details of all your options. On all of the evenings you will have a choice of places to eat which on most days will include the option to take a meal at your accommodation (may require booking in advance) or to be transferred by your accommodation provider to the local pub. APPLEBY: Penrith is on the main London to Glasgow rail link. 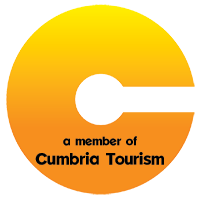 There are regular buses (Monday to Saturday) from Penrith Railway Station to Appleby taking approximately 40 minutes. Note that there are no Sunday services for this bus. 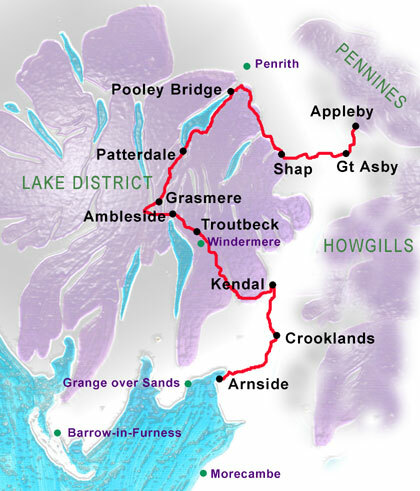 Appleby is also a stop on the scenic Settle to Carlisle railway line which runs 7 days a week. The Westmorland Way mostly follows river valleys, lake shores and even, towards the end, a canal tow path. It is therefore less strenuous than trails such as the Pennine Way or Coast to Coast which aim to keep to the high ground. The one exception is the day from Patterdale to Grasmere when you cross the main watershed between the valleys of the Eastern Lakes and Central Lakeland at Grisedale Hause. Other than this day, it should be possible to complete all the stages of the Westmorland Way in any weather.